Are Tron Guy and Xkcd the Future of Celebrity? If you ever watched the Star Wars Kid and Homestar Runner, or gawked at the Tron Guy and web comic Xkcd, you're changing the future of celebrity. You're building a world where Paris Hilton and Tom Cruise will be replaced by captioned pictures of cats and clever comics about algebra. At least, that was the premise of a conference held over the weekend at MIT called ROFLCon, which brought together the web's most famous meme-disseminators to prove that In The Future, Fame Will Be Different. Will it really? "We made him, made them, famous," Weinberger said while showing photographs of the Star Wars Kid, Obama Girl, the home page of Turkish net fad Mahir and clips of YouTube's ubiquitous laughing babies. Weinberger went on to describe the current state of the fame game, saying that the traditional model of Hollywood megacelebrity is "based on alienation" — a model, Weinberger says, that opens the door for us to reinterpret our notions of fame. "[Hollywood celebrities] cease to be famous when we see them as they are," a concept he demonstrated by showing several gossip magazine pictures of celebrities without their makeup. "Blogging, however, is all about taking off the 'makeup.' They're exposing themselves as fallible human beings." The same holds true for the rest of the web celebs. "What's famous on the web looks like it was done by a human hand," said Weinberger, while showing a Homestar Runner graphic. "They still feel like ours." "It's not just the homespun quality of what's famous on the web. It's how fame works — it's becoming much more DIY," said Weinberger. "Fame is now living in a long tail, or a long continuum of ways to be famous." While it sounded like a seriously fun party at ROFLCon, packed with people whose online creations I've been enjoying for years, it's hard to take seriously the idea that web celebrities are truly challenging the sartorial-celebrity industrial complex. Many of the "celebrities" in attendance didn't know who the other celebrities were, and a lot of the attendees were fans of the obscure rather than the popular. Ultimately ROFLCon was a gathering of people who are subculturally famous, the way many weirdo artists and creators have been for at least the past 200 years. I'd love it if Tron Guy's fame really were challenging Tom Hanks' fame, making all of us into potential celebrities. And making Tom Hanks into less of a big deal, which he really should be. But if anything, ROFLCon proved that challenge isn't happening. Web celebrities, if you can call them that, have hundreds of cool, devoted fans. But they're going to need millions before I'm convinced that, as Weinberger asserts, we're "reinterpreting our notions of fame." I guess what I'm saying is that millions of downloads aren't the same as millions of fans. Until they are, Gem Sweater lady will never vanquish Paris Hilton. I'm not sure if that's a tragedy or a joke. 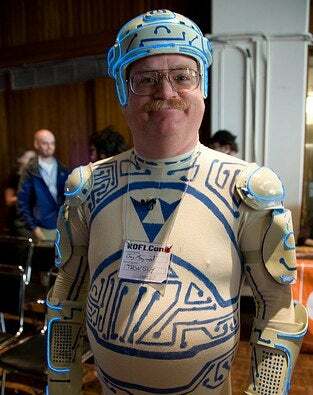 Tron Guy photographed by Scott Beale.